When I am crunched for time and need to get in a good workout the best way I have found to do this is with an exercise ball. Not only is it challenging but it gets your heart rate up and makes your muscles quiver. You can always do more or less sets depending on the amount of time you have available. The 20 - minute time was figured with an average of 2 sets for most of the exercises unless indicated otherwise. Where Can I Do the Total Ball Workout? - At home in your living room. - Outside, preferably in grass. - When you travel (I carry my ball with me deflated with a small pump and blow it up and use it when I get to where I’m going). What Size Exercise Ball do I Need? 65 cm balls fit most average sized people. If you are shorter than 5’4” try the 55 cm ball and taller than 6’ try the 75cm ball. They can be found in sporting goods stores, large chain stores like Wal-mart and Target, in discount outlet stores and some sections of department stores where you find fitness apparel. It’s no fun to exercise! I don’t have the right equipment! Click here if you prefer the 35 Minute Core Ball Workout Challenge DVD. YOU NOW HAVE EVERYTHING YOU NEED RIGHT HERE! Just 3 workouts a week with the exercise ball ebook will totally transform your body. You will start noticing a difference in just a few sessions and after 6 weeks your body will become, well, something else! Your waistline will get smaller, daily activities will become easier with more strength to carry groceries, mow the lawn, lift your kids, flexibility will improve, and your joints and muscles will ache less. This workout is not only quick and efficient but it effectively works all the muscles of the body while constantly stabilizing the core or midsection. When you are finished you will feel well worked out and energized from the all over body stimulation. So ask yourself, do you feel lucky today? Are you ready to get in shape and feel great? For only $8.95 you can get started right now by downloading your Exercise Ball Ebook and start enjoying life again! Normally you would pay a personal trainer anywhere from $40 - $80 for an hour to show you how to do these exercises. You can get these very detailed exercises today for a great value. If you have questions about how to do any of the exercises after receiving the book feel free to contact me and I will work with you to feel confident in what you are doing. EXTRA BONUS!!!!! 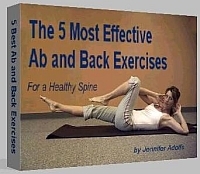 When you order today you’ll receive this great bonus ebook: The 5 best back and abdominal exercises. These exercises have been tested and proven as the most effective at working all the layers of abdominal muscles. Try it and see how much better you look and feel! Progress your exercises by increasing range of motion. Dynamic transitions with the rolling motion of the ball. Improved breathing techniques with more focused breaths and movements. Only $8.95 for a great workout! Leave Exercise Ball Ebook and find out more about how Pilates exercises can benefit you.